I’m excited about this episode’s topic because it’s going to provide some of you out there who are doing some great nuggets and awesome stuff to help you accelerate your business. For those of you who aren’t doing anything, you’re probably not going to enjoy this webinar because it’s got some cool things. You’ve got to be doing things to take advantage of what’s going on with this episode. If you are looking at your goal in 2019 is to add some things and start marketing a little bit more, you’re going to want to definitely be here to enjoy what I have to share with you. 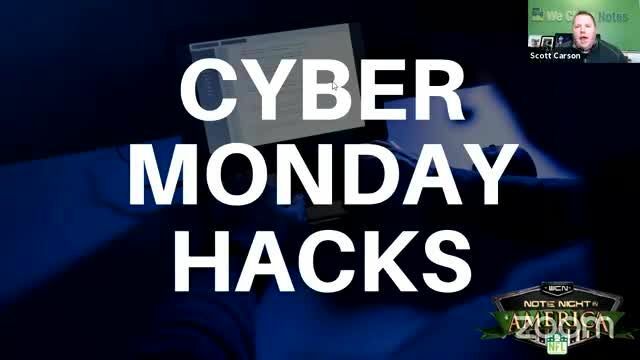 This is Cyber Monday Hacks is what I like to call it. I want to thank all of you for joining us on the show. Go to WeCloseNotes.TV or my Vimeo account. Go ahead and subscribe there. You’ll find us on YouTube as well, subscribe there. We have hundreds and hundreds of videos there along with the Note Night In America webinars. You can always go and listen to the Note Night In America webinars on iTunes, Stitcher. It’s one of the podcasts that we do on a regular basis. Subscribe, listen, it’s a great nugget for you. We’re always glad to have you here. Thank you for the messages. Thank you for the reviews. Thank you for the emails. Thank you for the Thank you notes. I love getting Thank You notes. It lets us know that we keep doing the right thing. At the beginning of 2018, we set a goal for our five-year goal to be able to help educate and create 10,000 note investors over the next five years. We started at the beginning of 2018. We’ve surpassed the 2,000 marker for the year. We’re trying to hit or beat the number from 2017. We think the 10,000 goal is possible. I do not think it’s going to be too many investors, not enough deals as long as you continue to market. Those that complain about not finding enough deals because there are too many investors the area, that’s because you’re not marketing. You’re being lazy. There are plenty of inventory around. There are plenty of amazing deals out there. I want to thank everybody. Our The WCN Crew Facebook page surpassed over 900 members. This happened when we had Note CAMP. We had Brecht Palombo on the previous episode of Note Night in America and also as a bonus session for Note CAMP and George Antone. Kudos to all of you that joined us. We’re going to be taking that and converting Note CAMP into another podcast. Season two for Note CAMP on iTunes and Stitcher. A big shout out to our 900 members on The WCN Crew Facebook page. I’m honored to have you. Thank you for those that are new members. Thanks for sharing. Thanks for our existing all shares. The group has been around for several months. We expect probably to hit hopefully 1,000 members by the end of 2018. I don’t know if we’ll hit that mark, but we may get close to it. If you’re not a member of that, go ahead check out The WCN Crew on Facebook. We’d be glad to have you.